Please find an assortment of boxes here that represent a variety of work over Jordans long career. Some of this collection is available for live viewing as well. Please click here to see some of Lawrence Jordan's Box Collection. Within these boxes the silent, still mysterious voice of the “object as being” can be heard... the objects move from external reality and correspond to an inner necessity. It is the unconscious made external, the objectification of desire. 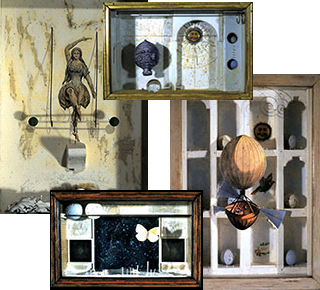 There are a variety of types and themes to Lawrence’s collages. Please enjoy this variety from the early years, along with links to 2 of the most recent releases by year below.